Dreamers Wanted…Disney invites you to an incredible world of epic imagination where anything is possible. Buckle your seat belt, as the director of The Incredibles takes your family on an action-packed thrill ride. 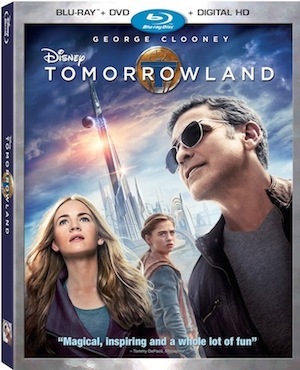 Tomorrowland transports you on an inspiring and magical journey of wonder and adventure to a place where if you can dream it, you can do it. This is my favorite film of 2015 so far and I am excited for a bunch of Tomorrows to happen to get me to October 13th when I can own this underrated masterpiece on Blu-ray™ Combo Pack, Digital HD and Disney Movies Anywhere! 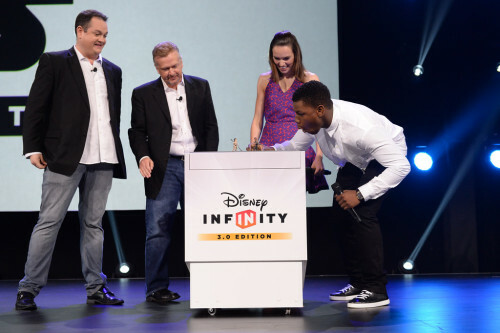 This past weekend, during a presentation at the D23 Expo 2015, Disney Consumer Products and Interactive Media revealed new details about some of the biggest products in the interactive entertainment industry including Disney Infinity 3.0 Edition, Playmation and KINGDOM HEARTS III plus two new limited edition Star Wars™ PlayStation®4 hardware bundles. Today, Disney announced a line-up of new attractions and entertainment coming to its theme parks around the world during the D23 EXPO 2015 in Anaheim, Calif.
Disney has announced it is creating a 14-acre space dedicated to “Star Wars” in both its Orlando and Anaheim theme parks that will transport guests to an immersive new planet inhabited by humanoids, aliens and droids. 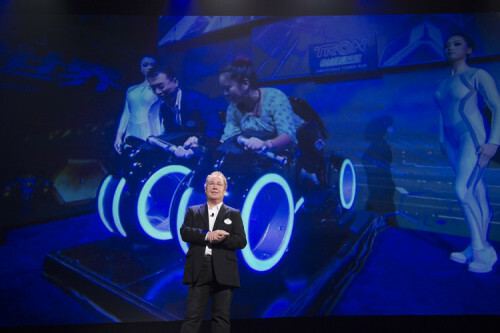 The two new lands will be the largest single-themed park expansion ever for Disney Parks, it was announced by Bob Iger at D23 Expo. Each store and restaurant will stay true to the “Star Wars” anthology and there will be creatures roaming through the parks, all of them “In-Story” at all times. 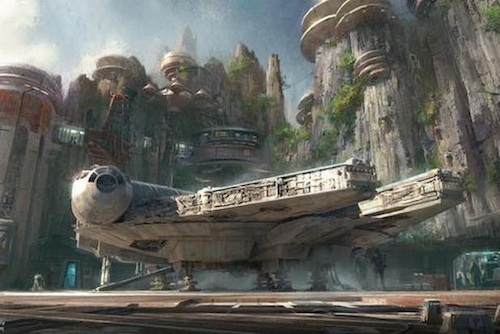 There will also be a lifesize Millennium Falcon as well as a Cantina — no word yet on if they will serve alcoholic elixirs, although it is a safe bet the Orlando location will as its “Hollywood Studios” park already serves booze. Before Iger’s announcement, Harrison Ford surprised fans and took the stage alongside his “The Force Awakens” costars John Boyega, Daisy Ridley, Oscar Isaac, Lupita Nyong’o and director J.J. Abrams. “Following in the footsteps of George Lucas, the author of the early chapters of my story, I’m delighted to be here now with J.J. and this wonderful cast and with Disney which has supported this effort in a really extraordinary way and will continue to do so I’m sure. It’s great to be here with you because you make this whole thing happen. Thank you so much,” said Ford. No specific date was announced, but it is expected that the new lands will open their gates before Episode IX hits theaters in 2019. Marking the first Star Wars brand collaboration for a credit card for The Walt Disney Company [NYSE: DIS], Chase Card Services, a division of JPMorgan Chase & Co. [NYSE: JPM] and Disney, are putting The Force in Cardmembers’ wallets with the introduction of three exclusive Star Wars designs to the Disney Visa Credit Card family, accompanied by exciting, new and exclusive Star Wars perks for all Disney Visa Credit Cardmembers. Cardmembers will be able to carry the new double-sided card designs featuring Darth Vader, Yoda or R2-D2 with C-3PO.1 In addition, all Disney Visa Credit Cardmembers can have access to the exclusive Star Wars Imperial Meet ‘N’ Greet, featuring the Supreme Commander of Imperial Forces, Darth Vader, at private Cardmember locations at the Disneyland® Resort and Walt Disney World® Resort.2, 3 The Star Wars Imperial Meet ‘N’ Greet experience opens at the Disneyland® Resort in fall 2015 and at Walt Disney World® Resort in early 2016. All Disney Visa Cardmembers can also enjoy savings on select Star Wars merchandise purchases at Disney Store and select locations at Walt Disney World® and the Disneyland® Resorts and can have the opportunity to take advantage of upcoming Star Wars-related limited-time offers. Today at D23, Walt Disney Studios Chairman Alan Horn announced that writer-director Colin Trevorrow will direct Star Wars: Episode IX, which is set for release in 2019. 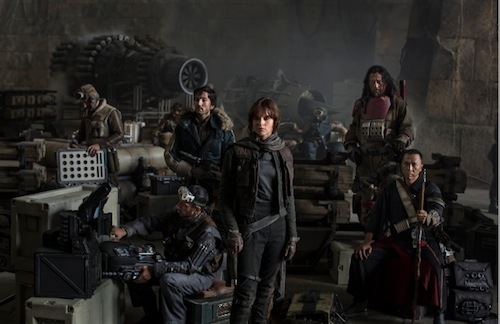 Lucasfilm announced today that their first film in the new standalone Star Wars stories series, “Rogue One,” has begun principal photography. Gareth Edwards (“Godzilla,” “Monsters”) is directing “Rogue One,” which tells the story of resistance fighters who have united to steal plans to the dreaded Death Star. The film is produced by Kathleen Kennedy and is slated for a December 16, 2016 release. Pixar Animation Studios’ John Lasseter, who’s one of Pixar’s three founders, was joined on stage by several award-winning artists and filmmakers, including Pete Docter (“Inside Out,” “Up”), Andrew Stanton (“Finding Nemo,” “WALL·E”), Lee Unkrich (“Coco,” “Toy Story 3”), Josh Cooley (“Cars 2,” “Ratatouille”) and Galyn Susman (“Toy Story 4,” ABC’s “Toy Story OF TERROR!”). Celebrating 20 years since “Toy Story” transformed the animation industry and the art of storytelling, the Pixar team welcomed iconic two-time Oscar®-winning songwriter and longtime Pixar collaborator Randy Newman, whose Pixar credits include “Toy Story,” “A Bug’s Life,” “Toy Story 2,” “Monsters, Inc.” and “Cars.” Also joining in the celebration were writers Rashida Jones and Will McCormack (“Celeste & Jesse Forever”), who are part of the “Toy Story 4” team, though details of Buzz and Woody’s return to the big screen were mysteriously missing. 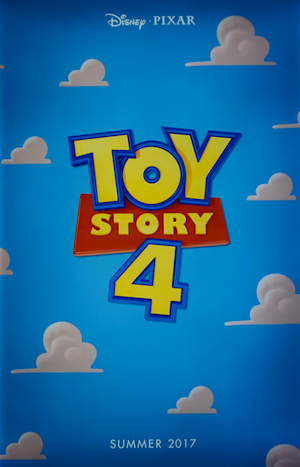 “Toy Story 4,” which will be directed by Lasseter and produced by Susman, is slated for release on June 16, 2017. Ellen DeGeneres, the voice of everyone’s favorite forgetful blue tang, took a dip with D23 EXPO attendees this afternoon, celebrating Disney·Pixar’s upcoming film “Finding Dory.” Joining DeGeneres on stage this afternoon were Ed O’Neill, who lends his voice to Hank, a cantankerous octopus; Ty Burrell, the voice of Bailey, a misguided beluga whale; and Kaitlin Olson, who voices Destiny, a kind-hearted whale shark. Oscar®-winning director Andrew Stanton (“Finding Nemo,” “WALL•E”), co-director Angus MacLane and producer Lindsey Collins (co-producer “WALL•E”) offered new details of the all-new story, which reunites Dory with friends Nemo and Marlin on a search for answers about her past. What can she remember? Who are her parents? And where did she learn to speak Whale? 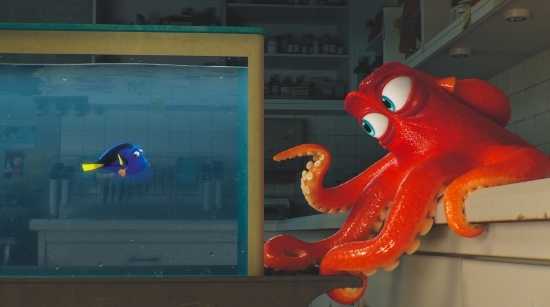 Also featuring the voices of Albert Brooks, Diane Keaton and Eugene Levy, Disney·Pixar’s “Finding Dory” swims into theaters June 17, 2016. One of the bigger surprises at the giant D23 animation panel was the unveiling of the new Disney•Pixar film Coco. Now some of you might remember this project as being the previously untitled animated feature that centers on the Mexican celebration of Dia de los Muertos. 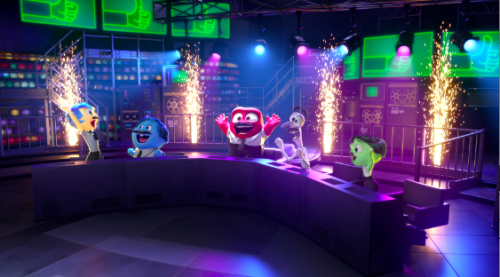 This new film is directed by longtime Toy Story 3’s Lee Unkrich and produced by Darla Anderson. The main character is a 12-year-old boy named Miguel, who somehow finds himself in the fantastical realm of dead. After the brief explanation, Unkrich and Anderson treated the D23 attendees with a “diorama,” meant to express the general feeling of Coco. This “diorama” was incredible and visualized as a single shot moving through the mortal version of Dia de los Muertos, with people celebrating and lighting candles for the family members who have passed on, and moving into the uproarious landscape of the dead. This is where things really take off, with skeleton mariachi bands, colorful designs, and lots and lots of fun. John Lasseter described it as “breathtaking, beautiful and fun,” and based on the diorama presented, we couldn’t agree more. “MOANA” ROCKS D23 EXPO 2015 – Dwayne Johnson (“San Andreas,” “Furious 7,” HBO’s “Ballers”), who lends his voice to the mighty demi-god Maui in Walt Disney Animation Studios’ “Moana,” hit the stage at D23 EXPO 2015 this afternoon. Renowned directors John Musker and Ron Clements (“The Little Mermaid,” “The Princess and the Frog,” “Aladdin”), and producer Osnat Shurer (Oscar®-nominated Pixar shorts “One Man Band,” “Boundin’”) shared dazzling early test footage and revealed plans for the film’s inspired music and the extraordinary team behind it. Tony®-winner Lin-Manuel Miranda (Broadway’s hottest new hit “Hamilton,” Tony-winning “In the Heights”), Grammy®-winning composer Mark Mancina (“Speed”, “Tarzan” “The Lion King”) and Opetaia Foa’i (founder and lead singer of the world music award-winning band Te Vaka) blend their diverse and dynamic talents to help tell the tale of a spirited teenager who sets out to prove herself a master wayfinder. Johnson said he is “deeply connected to this film,” given his half-black, half-Samoan heritage. “To tell a story about the South Pacific is truly an honor,” Mr. Johnson said to a cheering audience. HAVE YOU HERD? 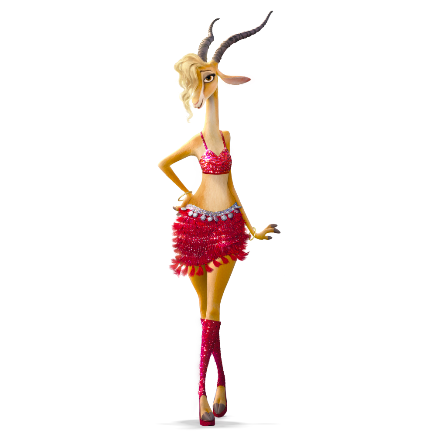 — Zootopia’s biggest pop star Gazelle will be voiced by Grammy®-winning international superstar Shakira in Walt Disney Animation Studios’ “Zootopia.” Shakira performs an all-new original song, “Try Everything,” for the film. Directed by Byron Howard (“Tangled”) and Rich Moore (“Wreck-It Ralph”), and produced by Clark Spencer (“Wreck-It Ralph”), “Zootopia” opens nationwide March 4, 2016. 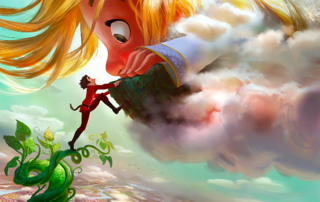 Walt Disney Pictures will produce its version of “Jack and the Beanstalk,” titled “Gigantic,” John Lasseter announced on Friday at the D23 Expo in Anaheim, CA! Robert Lopez and Kristen Anderson-Lopez, who wrote songs for “Frozen,” will do the same for “Gigantic.” The Oscar-winning duo took the stage to sing a catchy song from the upcoming film, proving that Frozen was only the first stop on the magical Disney ride they are currently on. “Gigantic,” will take place in Spain during the Age of Exploration. Adventure-seeker Jack will ascend the beanstalk and find a whole new world up in the sky as he discovers giants, most notably an 11-year-old, 60-foot-tall girl. “Gigantic” hits theaters in 2018.